Given how riveting the tale of Robin Hood is, I surely hope others don’t wait as long as I did to finally read this masterpiece of children’s literature. It is everything I had hoped it would be…goodness, humor, cleverness, a bit of blood and gore here and there, and wonderful, memorable character studies. The version of the children’s book that I recommend has illustrations by N. C. Wyeth, father of 20th century artist Andrew Wyeth. I’m sure there are other versions out there, but this version is very true to the ballads that are the source of the Robin Hood tales. Reading this children’s book made me quite curious about the sources, so I did some research. It turns out that the character Robin Hood has been in ballads since about the 12th century, and has changed character as time went on. The character that we most know now evolved somewhere in the 18th century. In any case, to say this is a classic is surely an understatement. While the book is not as simple to read because of the sometimes archaic language, I think it is perfect for strong readers in middle school, about age 10 and up. It goes really well also with any grade studying medieval England. 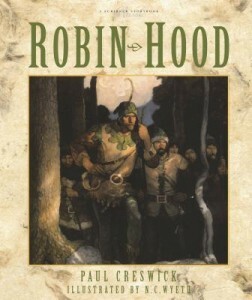 If you have a younger child who is into Robin Hood, and you don’t want to wait so long, there’s a simple version of one story, in a lovely children’s book called Robin Hood And The Golden Arrow perfect for 5-8 year olds.